Most people’s finances are like a house of cards, with their ability to earn an income acting as the bottom row. Everything else rests upon this bottom layer and, should the worst happen and your income stop, the whole house can come tumbling down. Life and health insurance protection underpins most good financial planning. These types of insurance can ensure that, if the worst should happen, the right amount of money will reach the right hands at the right time. 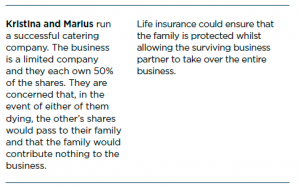 Life insurance – ensuring those left behind have funds after the death of a parent or some other person with dependents. Health insurance – making sure that you have enough money if you fall seriously ill.
Medical insurance – making sure that you have access to the best medical treatment when it is needed. This guide gives a brief insight into the importance of financial protection and the different forms of protection to consider. What type of insurance you take out will depend on your goals and needs, but appropriate protection should form the basis of a strong financial plan. Life insurance puts money in the hands of those who need it when a person dies. There are many reasons why this money might be needed. If your income would stop upon your death, and you have people who depend on you financially, you should have life insurance cover. If you live with a spouse or partner and their earnings would also stop at death, they too should have insurance cover. However, if you do not have financial dependents, you may not have a need for life assurance. Life insurance can provide the money your family needs to deal with the costs of raising a child, a mortgage, a funeral, running a business or many more things, at the time when they may need it the most. The life insurance needed to cover a loan is relatively simple to assess. You need enough insurance for the amount of the loan, and the cover should last for the time that the loan is outstanding. If you pay off some of the loan, you should be able to reduce the amount of cover earmarked for this purpose. Most people also need insurance cover to replace their income if they were to die. The same principles apply but the calculations are a little more complicated. Sandeep and his wife Aasha have a son of five who is about to start school. They have decided to send him to a fee-paying school and expect him to be there until he is 18. Sandeep and Aasha are now considering life insurance to ensure that the fees could continue to be paid for the next 13 years. The first thing to do is therefore to quantify the total cost of school fees over the next 13 years, taking inflation into account. The approach to insuring other needs is roughly the same. For example, you could calculate how much your family would need to cover the general household and other expenses, and how long they would need the funds. You can arrange for life cover to pay out a series of annual amounts over a set period, which is a simple approach to replacing an annual income, but most life cover pays out a lump sum. If you want a lump sum to provide £1,000 a year for 10 years, you would need life cover of about £10,000 because even if you invested a lump sum it wouldn’t have long to grow before you needed to spend it. If you needed the income for 20 years, however, you might only need about £18,500 because you could invest some of this for the longer term and benefit from growth and income. It is sometimes hard to work out how much life cover you would require for your family, because of the difficulties of assessing your family’s needs after one or both parents have died. Current levels of expenditure provide a good starting point for these estimates. Then you would have to consider the other costs that might be involved, like child care. It can be especially difficult to assess the potential financial impact of the death of a parent who spends most of their time looking after children and the household. A good starting point is to estimate the costs of buying in these services. Term assurance is the right sort of cover for most types of family protection needs. It can provide insurance at the lowest cost for the period that it is required. It is rare that you would need other types of life insurance for family protection, because they generally involve much higher costs than term assurance for comparable levels of cover. Whole of life assurance provides cover for the whole of your life, as the name implies, and its main use is in inheritance tax planning and provision for funeral expenses. Endowment policies are essentially savings products with some added life assurance and they can be used for repaying mortgages, although they are much less widely sold than they were in the past. Both whole of life and endowment policies can have substantial investment values that you can cash-in, unlike term assurance policies. Term assurance is the simplest form of life insurance, working in a similar way to your house insurance. The policy will pay out if you die during the term, but if you survive to the end of the term, the contract simply ends and there is no pay-out. The cost of life insurance varies considerably according to factors such as your age and state of health. The cost of 10- year term assurance for a 30-year-old is about a tenth of the same cover for a 60-year-old. A person’s state of health is also important; poor health could mean increased premiums or even the possibility that the individual cannot be insured. 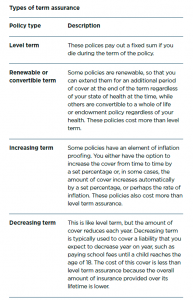 Although term assurance is a simple product, there are variations that suit different needs. You should decide what you want your insurance to provide for and take the time to work out what that means, and how much money would be needed to meet the goal. Mark has twin children, aged five. He wants to ensure that if he died, the family would be protected until the twins reach 21. He feels they would need £30,000 a year for this and takes out a family income benefit policy to cover the liability. If he were to die in year one, the policy would pay £30,000 a year for 16 years – a total of £480,000. If he were to die two years before the end of the term, it would pay £60,000 in total. 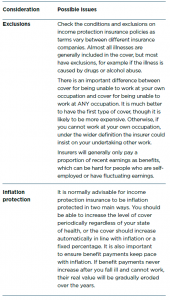 If you are employed, you may well have life cover from your employer and you should generally take this cover into account when deciding how much insurance you need. Employers can take out these policies on the lives of employees. They are not part of their pensions, but they have many of the same tax advantages. There may be situations where you could take out a policy on more than one life. The policy could then pay out after both the insured people have died sometimes used for inheritance tax planning. Alternatively, the policy might be arranged so that it pays out when the first of the insured people That would mean, however, that the second person would no longer be covered by the policy after the first of the couple dies. There are many types of insurance policy available, which you can use to provide the specific protection you need. The best way to ensure that the proceeds of a life policy are paid to the people you intend to benefit is generally to arrange for the policy to be in a trust. Some types of trust give the trustees discretions or flexibility about how they distribute the benefits, but it is a good idea to get advice about this. If you die, the policy proceeds will be paid to the trustees and then the beneficiaries, not into your estate. 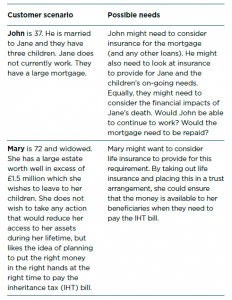 This arrangement could save IHT and should speed up the payment to the beneficiaries. There are other ways to set up life policies. The person you want to benefit could take out the policy – the so-called life of another basis. In some circumstances this can be a wise arrangement, especially if the potential beneficiary wants to be certain that the premiums on the policy are being paid. But mostly it is preferable to arrange for a policy to be in trust. The purpose of health insurance is to provide some money if you fall seriously ill or have an accident, potentially affecting you for many years. In this case, you would probably stop earning, although your financial needs might well be greater than ever. The state benefits you would receive would be relatively low and would be most unlikely to provide sufficient income to meet your needs, especially if you have substantial rent or mortgage payments to make. You might also need capital, for example to make adaptations to your home or to pay off loans or other liabilities. Virtually everyone who is working needs some kind of health insurance to provide financial protection if their earnings are affected by serious illness or disability. Even if you have no financial dependents, there is a very strong chance that you will need health insurance. Income protection insurance – sometimes called permanent health insurance – pays a weekly or monthly income if you cannot work because of illness or disability. You may think that you do not need to worry about this kind of cover, but the fact is that in the UK there are over 11 million people with a limiting long-term illness, impairment or disability. The prevalence of disability rises with age. Around 6% of children are disabled, compared to 16% of working age adults and 45% of adults over state pension age. You can generally be insured to receive a benefit of up to about half to two-thirds of your pre-tax income. If you have no income, you may still be able to take out a policy, but the maximum payout will be limited, generally to an income of about £20,000 a year. Some employers provide income protection insurance, but a very large number do not. Employers are only legally obliged to pay employees, in the form of statutory sick pay, for the first 28 weeks of their being unable to work because of an illness or injury; even then not everyone will qualify, and the employer does not have to pay the full salary. It is worth specifically checking the position with your employer. If your employer provides cover, the benefits generally continue to be subject to income tax and national insurance contributions, at least initially, but you won’t usually have to pay tax on the premiums. If you take out the cover yourself, the benefits are tax free. It is important to consider what happens if you are unable to continue working, and how income protection insurance can provide security for you. Income protection insurance pays after a waiting period on each claim, and can usually continue to pay you up to retirement age. The cover normally lasts until you are aged 60 or 65, but you can arrange the insurance for much shorter periods – say five or ten years – and this cover is much cheaper because it is substantially less valuable. The chances of having a serious illness or disability increase substantially as you grow older. Income protection can appear relatively expensive, but can be very valuable if you fall seriously ill. 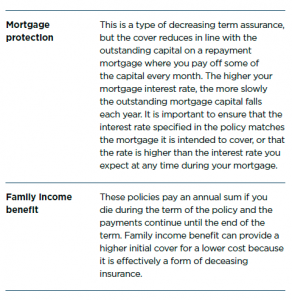 If you are considering taking out a policy these are some of the things you should consider. David works as an IT manager. He earns a good wage and he lives a comfortable lifestyle. In the event of being unable to work due to illness, he would receive full pay for up to four weeks, but would then only receive statutory sick pay and, later, state benefits if he is eligible for them. He would not be able to continue to meet his commitments and may have to sell his flat should the illness continue into the long term. David might consider income protection to provide an ongoing income after his employer stops paying him. This could continue until his selected retirement age or, if he wanted to keep premiums down, for a limited term of, say, five years. Critical illness insurance pays a lump sum if you are diagnosed as suffering from a specified illness. Over 30 conditions may be covered, including serious cancers, heart attack and stroke. Some providers may cover significantly more – even up to 100 different conditions. The advantage of critical illness insurance is the benefit is paid very early, shortly after diagnosis of the illness, without any significant delay – unlike the usual longer waiting periods of income protection. It is also in the form of a lump sum that can allow you to make rapid adjustments to your lifestyle and pay off loans. The main drawback is that this type of health insurance only covers a limited set of conditions. These are common disabilities, but critical illness insurance generally does not cover some important conditions, such as musculoskeletal pain and most mental illnesses. Critical illness insurance is generally paid very early – typically earlier than income protection insurance – so can allow you to react to a diagnosis more quickly. People often take out critical illness insurance to cover a mortgage or other loan. Because you are significantly more likely to have a critical illness than die whilst you are of working age, it is more expensive than life insurance. But this reflects the likelihood of needing to claim on the policy. Critical illness is an important and valuable addition to income protection, but it should not normally be regarded as a replacement for it. Accident, sickness and unemployment (ASU) insurance pays a monthly income for up to one or two years only if you cannot work because of illness, disability or unemployment. Some policies pay off any loan if you die. People often take out ASU insurance in conjunction with a loan. Policies usually last for the term of the loan or up to retirement age. The unemployment part of the insurance may be limited to employees; self-employed may not be able to take out this part of the cover. 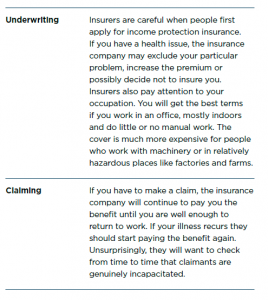 The final area to consider is medical insurance. These policies help you to afford the cost of private medical treatment. Private medical insurance (PMI) pays for private health treatment. Depending on your budget, you choose what you want covered – just in-patient or day-patient treatment, or out-patient consultations and medical tests. PMI pays for the treatment of acute conditions only. It does not cover chronic conditions and pre-existing conditions may also be excluded. Health cash plans pay for everyday health costs, typically 75%–100% of costs for dentistry, optical and consultation costs, plus a small sum for each day spent in hospital, subject to an annual limit. Other dental options include capitation (maintenance) plans, which are agreed with your dentist and cover likely costs over the next year, and dental insurance. Plans may require an initial waiting period to stop people taking out cover for known treatment then cancelling the policy. Know enough about you to make the right We take the time to understand your financial situation, your needs, preferences and views. We don’t expect you to be an expert on insurance, but we need to know your attitude to risk. Whether for example, you would feel comfortable accepting that premiums may rise, or if you want a guaranteed solution. Recommend solutions to meet your The right policy is important, but a will or writing policies in trust could be too. This publication is for general information and is not intended to be advice to any specific person. You are recommended to seek competent professional advice before taking or refraining from taking any action on the basis of the contents of this publication. The Financial Conduct Authority does not regulate tax advice, so it is outside the investment protection rules of the Financial Services and Markets Act and the Financial Services Compensation Scheme. This publication represents our understanding of law and HM Revenue & Customs practice as at 28 January 2019.